AT THE CLOSE OF THE BILDERBERG MEETING held in Chantilly VA, June 5-8 2008, the Jew Timothy Geithner, President of the New York Branch of the Federal Reserve and Bilderberg 2008 attendee, penned a commentary piece in The Financial Times. — “The main global banks need to operate under a unified framework that provides a stronger form of consolidated supervision. Indeed, this Jew, Timothy Geithner, is a Zionist careerist with a lust for power! Already the Federal Reserve has 4 Jews ruling its 5-member Board of Governors. It looks like this Jew Geithner would like to be Chairman of the Board & rule the world! (He’ll still be a Rothschild puppet). 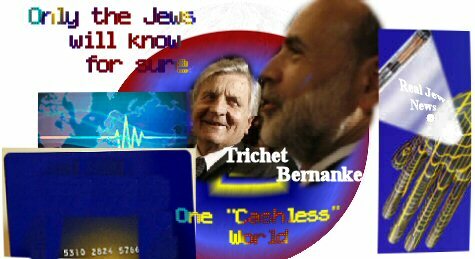 ONE OF THE MOST POWERFUL figures in the world of central banking, the Jew, Jean-Claude Trichet, President of the European Central Bank in Frankfurt Germany, was also a Bilderberg 2008 attendee. Trichet’s colleague, Gertrude Tumpel-Gugerell, of the ECB’s Executive Board, called for the beginnings of a “cashless world” through SEPA in her January 2008 speech to the European Commission of the EU. SEPA (Single Euro Payments Area) obliterates distinctions between national and intra-European cross border payments via the European Central Bank acting as the central Clearinghouse. — “Nine years ago we introduced the single currency. Today we launch SEPA – another important step in European integration. But today is only just the beginning! We can now make payments by European credit transfer. Gertrude tells us that this “cashless society” is “only just the beginning!” What will be next? A world-wide currency implanted in our wrists to eliminate paper? From the Eschatological Discourse and from other pertinent passages in Scripture, theologians have deduced six signs that must precede the end of the world. 1. Universal preaching of the Gospel. 2. Conversion of the Jews. 3. Return of Henoch and Elias. 5. The reign of the Antichrist. 6. Extraordinary disturbances in nature. In regard to the first sign, we have Our Lord’s words in the Eschatological Discourse: “And this gospel of the kingdom shall be preached in the whole world, for a witness to all nations; and then will come the end.” (Matt. 24:14). St. Augustine points out (Ep. 199, n.48) that this does not mean that all men will come into the Church, but simply that the Gospel shall have been preached to all nations and all men given the opportunity to embrace it. He also comments, “What does the phrase ‘then it will come’ mean except that it will not come before that time. How long after that time it will come we do not know. The only thing we know for certain is that it will not come sooner.” (Ep. 197, n. 4) Saint Augustine therefore considers the universal preaching of the Gospel a very remote sign of the world’s end. “For the children of Israel shall sit many days without king, and without prince, without sacrifice, and without altar, and without ephod, and without theraphim. And after this the children of Israel shall return, and shall seek the Lord their God, and David their king: and they shall fear the Lord, and His goodness in the last days.” (Osee 3:4-5). “Then shall they cry to the Lord, and He will not hear them: and He will hide His face from them at that time, as they have behaved wickedly in their devices. Thus saith the Lord concerning the prophets that make My people err, that bite with their teeth, and preach peace, and if a man give not something into their mouth, they prepare war against him. Therefore night shall be to you instead of vision, and darkness to you instead of divination; and the sun shall go down upon the prophets, and the day shall be darkened over them. And they shall be confounded that see visions and the diviners shall be confounded; and they shall cover their faces, because there is no answer of God.” (Mich. 3:4-7). “Thus saith the Lord of hosts: Behold I will save My people from the land of the east, and from the land of the going down of the sun. And I will bring them, and they shall dwell in the midst of Jerusalem: and they shall be My people, and I will be their God in truth and in justice.” (Zach. 8:78-9). “And when Jeremias came hither he found a hollow cave: and he carried in hither the tabernacle, and the ark, and the altar of incense, and so stopped the door. Then some of them that followed him, came up to mark the place: but they could not find it. And when Jeremias perceived it, he blamed them saying: The place shall be unknown, till God gather together the congregation of the people, and receive them to mercy.” (2 Mac. 2:5-7). Saint Paul developed this theme: “For I would not, brethren, have you ignorant of this mystery, lest you be wise in your own conceits, that a partial blindness only has befallen Israel, until the full number of the Gentiles should enter, and thus all Israel should be saved, as it is written, ‘There will come out of Sion the deliverer and he will take impiety from Jacob; and this is My covenant with them, when I shall take away their sins.’. . . For as you also at one time did not believe God but now have obtained mercy by reason of their unbelief, so they too have not now believed by reason of the mercy shown you, that they too may obtain mercy.” (Romans 11:25-27, 30-31). In the prophesy of Malachias in the Old Testament we read: “Behold I will send Elias the prophet before the coming of the great and dreadful day of the Lord.” (Mal. 4:5). Many of the Jews believed that this prophesy referred to the first coming of the Messiah. This is why the apostles asked the Lord, “Why then do the Scribes say that Elias must come first?” (Matt. 17:10). Our Lord answered, “Elias indeed is to come and will restore all things. But I say to you that Elias has come already, and they did not know him, but did to him whatever they wished . . . Then the disciples understood that He has spoken to them of John the Baptist.” (Matt. 17:11-13). Thus Saint John the Baptist was the “Elias” whose preaching preceded the first coming of Christ, but Elias himself will appear before the Second Coming. In regard to Henoch, we find in the book of Ecclesiasticus: “Henoch pleased God, and was translated into paradise that he may give repentance to the nations.” (Ecclus. 44:16). In the Apoclypse (11:3-12) mention is made of “two witnesses” who shall appear before the Second Coming of Christ. From the earliest times it has been believed that these witnesses will be Elias and Henoch preaching repentance to the nations, opposing the Antichrist, and working for the conversion of the Jews. In his second epistle to the Thessalonians, Saint Paul wrote, “Let no one deceive you in any way, for the day of the Lord will not come unless the apostasy comes first . . .” (2 Thess. 2:3). “And as it was in the days of Noe, even so will be the coming of the Son of Man. For as in the days before the flood they were eating and drinking, marrying and giving in marriage until the day Noe entered the ark, and they did not understand until the flood came and swept them all away: even so will be the coming of the Son of Man.” (Matt. 24:37-39). “Yet when the Son of Man comes, will he find, do you think, faith on the earth?” (Luke 18:8). “. . . in the last days there will come deceitful scoffers, men walking according to their own lusts, saying, ‘Where is the promise or His coming? For since the fathers fell asleep all things continue as they were from the beginning of creation.’” (2 Peter 3:3-4). The apostasy had already begun in Pauls day so he has said and written.False teachers had already crept into the Ecclesia (Church). We have been in apostashy for 2000 years already, most of what is taught buy the Church is is lies mixed with some truth. which is worst than outright lies, makes it very deceptive. what is now being made know is truth and they are calling it lies and false teaching, and it is not! In his second epistle to the Thessalonians, Saint Paul wrote, â€œLet no one deceive you in any way, for the day of the Lord will not come unless the apostasy comes first . . .â€ (2 Thess. 2:3). â€œYet when the Son of Man comes, will he find, do you think, faith on the earth?â€ (Luke 18:8). â€œAnd as it was in the days of Noe, even so will be the coming of the Son of Man. For as in the days before the flood they were eating and drinking, marrying and giving in marriage until the day Noe entered the ark, and they did not understand until the flood came and swept them all away: even so will be the coming of the Son of Man.â€ (Matt. 24:37-39). The (Matt. 24:37-39),”FLASH OF LIGHTNING” is already here, among us! those that know know, and tnhose that don’t don’t and won’t listen especially if the are a part of the Church Heirarchy. â€œYet when the Son of Man comes, will he find, do you think, faith on the earth?â€ (Luke 18:8). Yes, but, very few! â€œ. . . in the last days there will come deceitful scoffers, men walking according to their own lusts, saying, â€˜Where is the promise or His coming? For since the fathers fell asleep all things continue as they were from the beginning of creation.â€™â€ (2 Peter 3:3-4). The above is the heirarchy speaking, they do-not want to lose their Religious power control over their flock! Things appear hopeless as God has intended it to appear to His creatures, Remember Abraham anmd Sarah and the promise of a son, in their hopeless old age with their decreped as good as dead bodies, which were able to produce nothing, God does keep His promise. and He will! God is operating all in accord with the counsel of His will (Ephesians.1:11). All is going as it should, and will continue to do so! (Isaiah. 46:9-11). ; (Isaiah 45: 6, 7). very few humans have any faith at all! Why do the Jews call their country Isreal? It should be called Judea. Isreal was scattered by God and to be a forgotten peoples. We are getting closer everyday. The post 2 above is correct, Israel and Judah parted company in the 10th century BC, anytime they are mentioned after then is referring to 2 seperate peoples; Isralites and Judahites (Jews if you like). Failure to recognise this will inevitably lead to the misinterpretation of prophecy. > I, we have a Way,that is already pointing out the Way for us to follow. The author and finisher of our faith,Jesus Christ. You are a blessing Brother. Babylon the Great does not represent an economic system. Notice that after her destruction, not only the kings of the earth cry for her but, also the merchants of the world. Babylon the Great represents “The worldwide empire of false religion”. And this religious harlot will meet her end at the hands of her lovers, these same kings of the earth with whom she commits fornication…..
I’m Italian. Give me a Jew to handle my money any day. They certainly know how to handle their loot. We gave our money to Myer Lansky. Look what he did. He built Vegas! Thank you for enlightening posts and may God enlighten us. Just a query - given the fact that most modern day jews are not semetic in origin, are you aware of any indication of the repentance of jews in general or only of the minority who are semetic in origin? George, I would like to respond to your question with my own personal view, not necessarily Church teaching of which I am unfamiliar with on this issue. I feel that only God knows who the REAL Jews are. It matters to Him for His reasons — but Christ came that all might be saved. We can know that any spirit (or person) who does not recognize Jesus Christ as the Messiah, the Son of God, is of the antichrist: those are whom we must beware of. Unfortunately, there will be many born into “christian” families who will deny Christ and owe their allegiance to the god of Money, Influence, Avarice, Greed, Sloth and Lust. As Christians, we must take a stand against ALL evil wherever it exists, educating the ignorant about God’s ways vs. the ways of the world. In Catholic tradition it is a commandment, a spiritual work of mercy, to educate the sinner to the errors of his ways. What do you know about Benedict XV? Was he a tool of the Zionist? I can’t get a handle on him as all I know is how he swept out Cd. Merry del Val, a forthright man of Pius X. (and many others of the reign of St. Pius X.
I think that Benedict XV was under duress from within his own consistatory. He did not have the strength of Pope St Pius X. From the time of Benedict XV, the hierarchy of the Church would no longer lead (from in front) the opposition of the Church to the occult, international Jewish state and its Directorate which came to overtly to power in the Bolshevik Revolution through its revolutionary AGENTUR. That is opposition would no longer be led by the Holy Father and Cardinals, but by the lower clergy and the laiety. So great had the infiltration of the Church’s foes into the hierarchy become - a condition boldly denounced by Pope St Pius X in Pascendi. And indeed with the Oath Against Modernism, he did force them underground within the Church - but as he said, they were already infiltrated into the consistatory, the chanceries, the seminaries, the religious orders. From the time of Benedict XV the Church’s opposition to the public and declared enemies of the Church (within and without) would form around the sodalities of priests like Monseigneur Jouin, Father Dennis Fahey, Fr Coughlin and many others. They would be supported by the hierarchy (or not), but it takes a pastor and bishop of the calibre of Pope St Pius X to lead from the front. Pope Beneict XV obviously did not have that strength. Nevertheless, he is on record against the foes of the Church. On the publication of Msgr Jouin’s La Guerre Maconnique, the State Secretary to Pope Benedict XV, Cardinal Gaspari, wrote to Msgr Jouin and commended him for his work and pledged support. In La Guerre Mconnique (The Masonic War) by Msgr Jouin, he was the first to use the precise term ‘Judeo-masonry’ which designates the Directorate of the Jewish Internationale, its agenda for a novus ordo seculorum led by the Jewish Dynasts - B’nei Zion and their AGENTUR or entire network of agencies for the subversion and overthrow of nations, fomenting revolutions, social anarchy, cultures hostile to Christianity and - of course the overthrow of the Chair of Peter in Rome (1958) and the ‘reformation’ of the Catholic Church - a process far advanced today. How we must ask does someone profit so handsomely off of others’ misery and destruction of livelihoods? We know the game plan now. This planned failure of our economy and the unsustainable, parasitic, welfare state will lead to unprecedented suffering of the hapless Americans who will of course clamour for rescue from their federal tormenters who will gleefully comply. Amero and North American Union to the rescue. All the while, the Jewish financial robber barons have completely stripmined the country of its former wealth and its’ citizens rendered into debt slavery, third worldism, and misery. Just as they illegally saddled the hapless American public with the multi-billion dollar Mexican ‘bail-out’ and the S & L debacle of the 80’s, they are planning to piggyback this incalculable mortgage fiasco onto the sinking, hanging-by-a-thread American middle-class cash cow. Thanking you as always for your Godly work. What do you have to say about Padre Peitro (the modern day stigmata priest in the RC)? Was he anti-modernists? Fr Pio (Padre Pio) was steadfastly against Modernism - idenfified by Pope St Pius X as “the sum of heresies”. As a priest, he was faithful to the Oath Against Modernism which he would have taken at his ordination Sacrorum Antistitum. Although most popularly known (outside the Church) for the many miracles credited to him (and of course the Stigmata), he lived a cloistered life under obedience to his bishop in the Franciscan Order. His mission was to assist people to worthily confess their sins. And by discernment and word of knowledge of the Holy Spirit, he was, as a Confessor, able to assist the penitents to vividly recall sins that they had forgotten or would not admit and which remained upon the soul. He helped thousands to the great grace of true contrition and conversion to our Lord. He never celebrated the novus ordo mass of Paul VI but had a special dispensation from the antipope (whom his superiors recognized as pope) to celebrate the Roman Catholic mass of Tradition. He is most revered within the Church in Eclipse for his commentaries on the prophesies made by many saints throughout the centuries on the judgment of Our Lord upon this (our) time of the Great Apostacy - ‘the Three Days of Darkness’. Many discourses upon this. Padre Pio brought new insight and revelation to this most serious matter proclaimed by saints for at least 10 centuries - reserved for ‘the last times of the world’. The Church is not ‘in the dark’ about this matter, Deo Gratias in large part to Padre Pio’s many words of knowledge upon this subject. Thank you for the clarification. I watched I documentary about Padre Pio, and was touched by his traditional outlook, his life story and his refusal to “modernise” his appearance. He even had a beard. I didn’t notice however whether he died pre-Vatican II or not. I also found it interesting that the Pre-Vatican II traditions of the RC church had a lot in common with the Orthodox East. Nowadays the modern day Vatican II RC clergyman and church looks so foreign. Yet the irony is that the darkness of the Freemasonry lodge unites both the “official” RC and Orthodox churches so much that the Constantinople Patriarch Bartholomew and Pope Benedict are talking of almost union, the only matter dividing them is how to interpret the “primacy of the Pope” - all other dogmatical differences appear resolved under the excuses of “theology” the “evolved” under different “geographical locations” - a nice syncretistic camourflage! Yes, George, this is a most depressing development. Anti-Pope Benedict is promoting the Noachide Code as an acceptable jurisprudence for nations forming up the new world order (called for in the Vatican II Gaudium et Spes) The only type of Christianity that would be acceptable under the Noachida would be Arianism. The Noachide Code regards the worship of our Lord in his Divinity as idolatry. The EU has debated making a hate criminal of anyone who spells Christ with a capital C. This hatred of our Lord in his Divinity and Kingship is everywhere gaining ground. Whereas true Orthodoxy and Catholicism will hold to Nicea and Chalcedon. If they value the faith and the traditions they have from the Apostles, the Orthodox should steer clear of Benedict. The Catholics likewise. The Schism will remain on the basis of the doctrines that divide us, but that is far preferable to unity on the basis of apostacy that denies our Lord’s Divine nature. Just as there are quite a few ‘catholic’ crypto rabbis, there will be ‘orthodox’ ones as well. And for the disinterest of the religiously indifferent - the multitudes of seculars - they will probably ‘resolve’ the Great Schism and then the one world ecumenical church can really get off the marks. As objectionable as Schism is, it isn’t as bad as this. I can’t disagree - the Great Schism is nothing in comparison to today’s apostate “church” leaders who are leading indifferent Christians straight into the hands of the Antichrist. I recall the impious boast of John Paul II who wished to grant, the world united (under his leaderships) to Christ as a birthday gift on the 2000th anniversary of Christ’s birth. How can anyone grant Christ such a “gift” - a false union based on the deception of uniting “truths”, “half-truths”, “part-truths” etc together - and united with those who rejected Christ as the Messiah. May God show us His mercy and send us true pastors and political leaders with discernment and enlightenment to steer the world back to His truth - or least give us the patience to endure such trials! 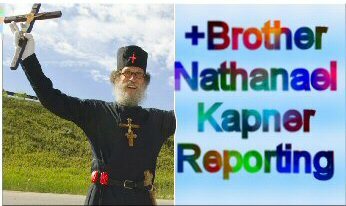 Brother Nathanael, Christians and Americans should be against a CASHLESS society. Anything that concentrates MORE POWER into the hands of the elite, particularly for economic or political expediency — should be resisted and rejected. But how many will be deceived into voting for a Cashless society in the name of convenience. Will they not have sold their birthright for a bowl of soup? Coinage was one way the American founding fathers intended to keep us Independent. When it goes, we are Less Free. I AM READY TO GET THIS S**T OVER WITH. IF WE GET PUT IN FEMA CAMPS, IT’S TOO LATE. AUDIT THE FED, RETURN TO WRITE-IN BALLOTS FOR VOTING, BRING HOME TROOPS EVERYWHERE. PUT FACTORY JOBS HERE IN AMERICA. STOP BUYING CHINESE GOODS. ONLY BUY AMERICAN WILL DEFEAT THE TYRANNY. Tu es un des derniers juifs que j’apprécie ! I am an anti-Zionist ex-gay French guy. God has been captured by satanic kings scribes possessed by the demon of ignorance, thinking they can write up tales empowering the kings Von into perpetuity write the vid angle above. There can only be one truth, when 2 people disagree either 1 or both are wrong, as we continue to elevate our magnitudes of literacy, led into our future by the great spirit of Truth. End free trade, make the things we use here in America, put an end to resurrection of slavery by the trading clan. Rid our nation of the FED, gangsters, remove criminality from any vestage of government. The ballot box originated when we were illiterate mostly, retained for its corruptability, we are ruled by the MOB.